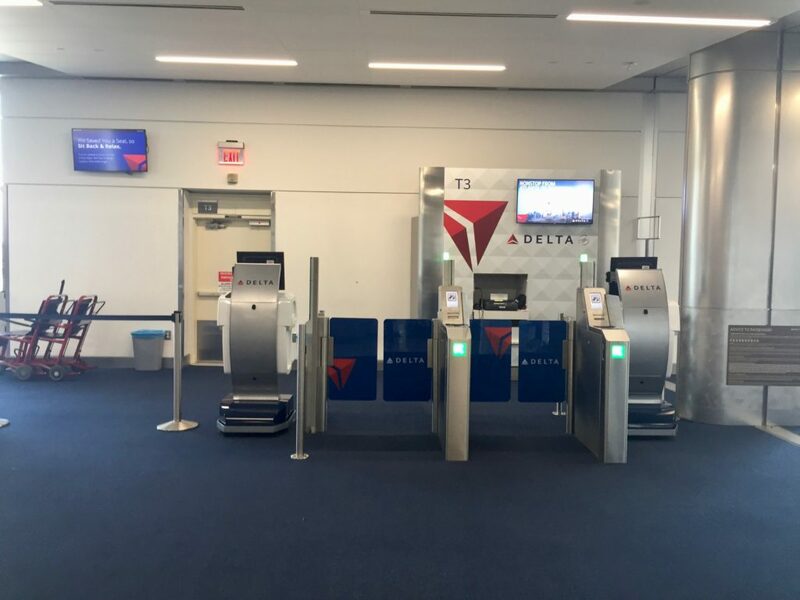 Delta Air Lines (“Delta“) introduced a new smart boarding experience at Terminal T of the Hartsfield-Jackson Atlanta International Airport (“ATL”) (Related News). Many asked why there is a new process being trialled, what are the benefits and the observations noted from using the experience. 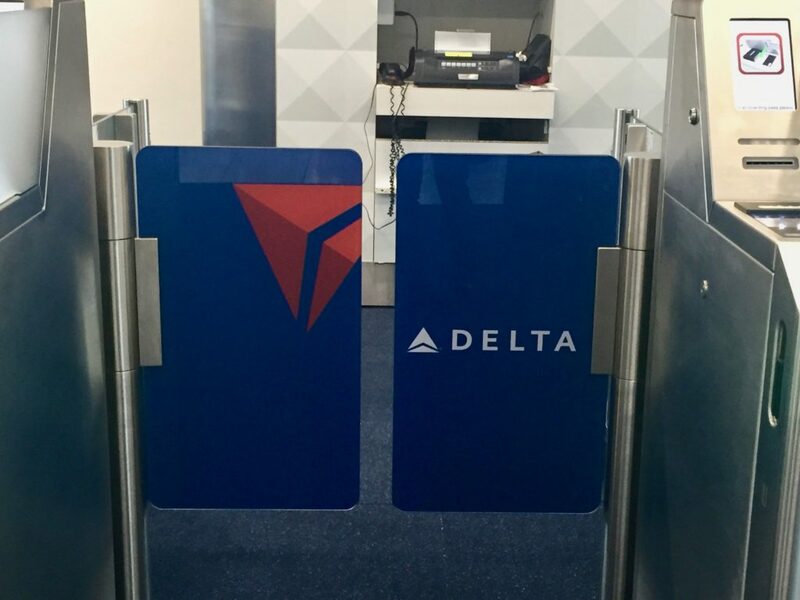 Delta is finding ways to improve space utilization at airports where gate expansion may not be possible. Turning traditional gate podiums into mobile agent pods not only reclaim space but also reduce the distance between the gate agent and the traveller. This will provide a better interaction experience between both parties. The mobility aspect will allow the airline to deploy pods and agents based on flight requirement. From an in-person interaction perspective, nomad devices allow agents to assist travellers with a user friendly computing interface designed to improve productivity and lower processing time. 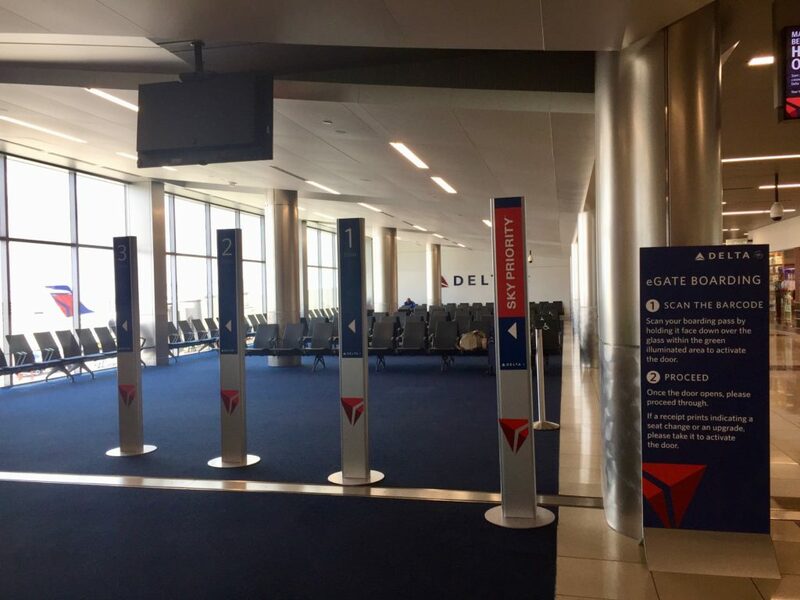 The new boarding pillars are similar to ones deployed by United Airlines at key hub airports. This setup would streamline the boarding process and avoid confusion on where to wait. 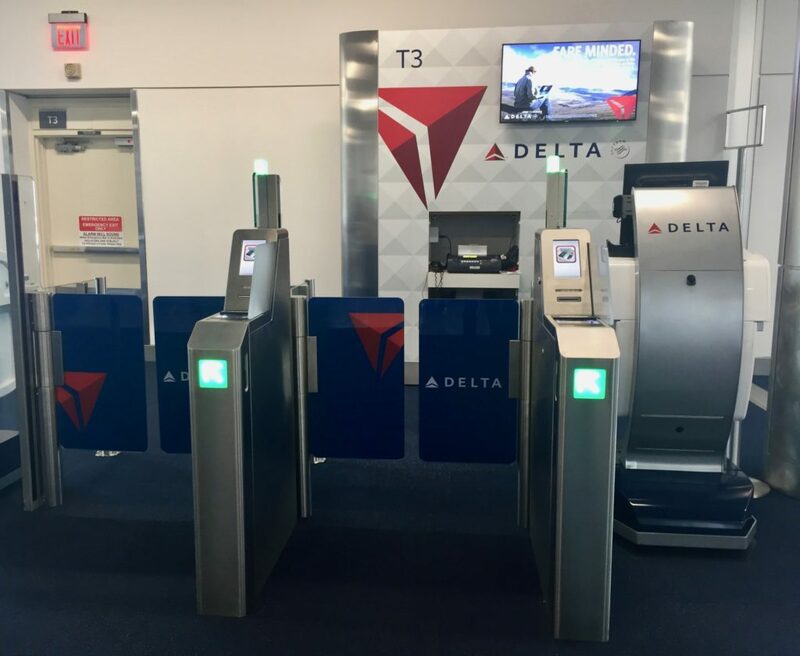 To maximize use of the pillars, Delta should integrate gate displays and mobile application to further manage the boarding process and avoid confusion. This would then reduce the use of public announcement systems which can be difficult to hear in a busy terminal concourse. E-gates will allow for self-boarding by scanning the phone or paper boarding passes. This would free up gate agents’ time to handle complex tasks that would require more attention. Algorithm used by e-gates will also reduce the rate that duplicate boarding passes would be accepted. ATL would benefit from the streamline boarding experience with reduced turnaround times. This would allow the airport to increase throughput and gate utilization without costly capital improvements. Terminal space saved from using mobile agent pods can change the way the gate area is designed. Space saved can be redeployed for non-aeronautical purposes (i.e. retail, food/beverage, services, etc). The mobile pods can also reduce maintenance required for the stationary podiums (including the physical structure, computer terminals, printers, cables, etc). This would reduce overall operating costs. 1. Pillar by group (Sky Priority, Group 1/2/3 are grouped together. Premium passengers have a separate pillar designated as PREM). There is an one-sided instruction sign to the right of the pillars. There are no additional signs noted facing the rows of chairs in the main gate area. 3. The e-gate door mechanism will open after the boarding pass has been verified. Experience The Skies followed the instructions on the signs for a flight from Atlanta (ATL) to New York (LGA) and found the experience to be positive overall. The following is a list of observations noted during the actual boarding process. Implementing changes to them can heighten efficiency and improve experience. While there are four big tv screens at the gate area, they were not placed strategically to maximize viewership. There were many people who inquired about standbys and upgrades information even though they were displayed on two of the four screens for at least 30 minutes. The one e-gate instruction sign was not placed strategically to show passengers what to do. Additionally, the sign did not incorporate any graphics to make it easier for passengers (e.g. Step 2 asks passengers to pick up the printed receipt if there is a seat change or upgrade, but where is the receipt coming from?). Gate agents did not ask passengers to consult this sign ahead of boarding. There was not enough time to enable families with young children to board without using the e-gate system. This created confusion as young children were asked to go through one by one like adults and the gates closed before they got through. The pillars indicating different groups (PREM, SKY, 1, 2, and 3) were useful. The latter four were placed too close together and did not have any lane barriers separating them. This led to many people from two groups lining up at the same area. Gate agents did not encourage passengers to line up behind the pillars ahead of time to ease boarding time. While a public announcement was made prior to boarding on the e-gate, there was no demonstration on how to use them beyond the signage. TV screens were not utilized to showcase which group is boarding. This led to confusion as to what to do during boarding and resulted in the alarm going off multiple times when a valid boarding pass scan did not trigger the e-gate to open. The airline did not send an email seeking feedback on the smart boarding experience after the flight was completed. 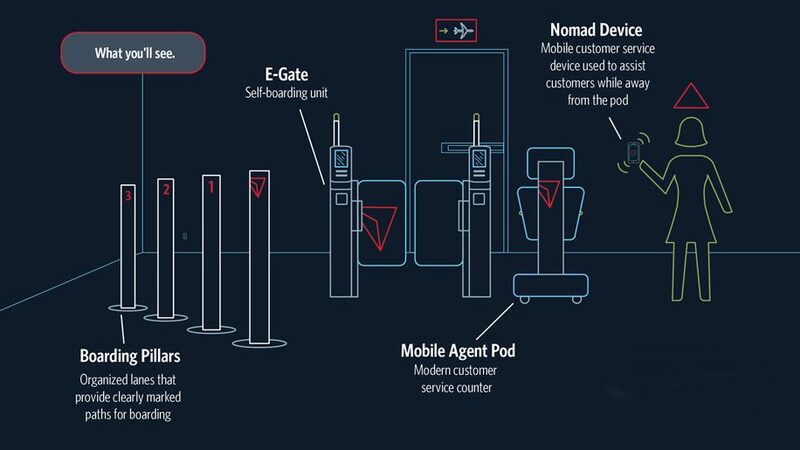 It is great for Delta to trial e-gates as part of its next generation smart boarding experience. While the actual boarding process requires some tweaks, the overall experience is positive one. Delta has many initiatives on the go this summer (Related News). It will be important to reconcile all the trials and build a cohesive plan to deploy technologies the airline finds effective across the travel experience. This will also require additional thinking around mobile application, online and on board in-flight features to ensure that travellers will have a consistent experience and the ability to access and modify information at their leisure. With more features added, the Nomad devices should be deployed to flight attendants on board to proactively assist travellers during irregular operations. They would also be useful to aid those who do not have access to on board Wi-Fi or itinerary. Based on updated information, flight attendants can also show more relevant connecting or arrival destination airport videos.